I finally got another hike in after much too long of an absence. Hopefully I can get my schedule back on track to do this more regularly again! This is the first hike I’ve done where I’m referencing the 3rd Edition of the 60 Hikes Atlanta book. 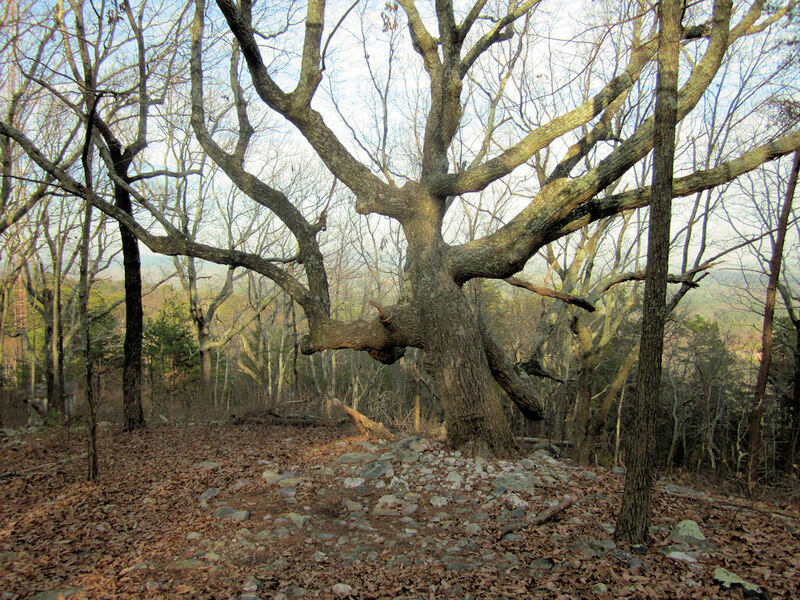 Previously #18 in the book was the Homestead Trail at Red Top Mountain State Park which I hiked back in November, 2012. This trail is in the same park, just a different trail. 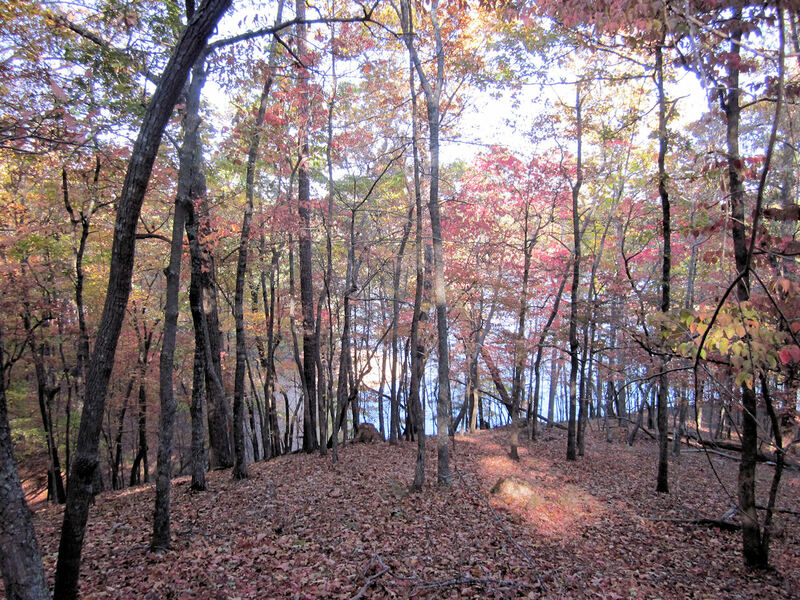 Red Top Mountain State Park is so named for the deep red color that makes up the soil of the mountain. The deep read indicates the presence of iron and this trail winds along two open-pit iron mines that were located here. The park occasionally has iron pour events to commemorate the mining history. The loop also winds along Lake Allatoona and you get some great long distance views, there’s also a variety of wildlife here and we saw various lizards, rabbits and squirrels as well as a pair of Red-Headed Woodpeckers that got away before we could get a picture. The trail itself is quite easygoing with only slight elevation changes. It’s quite wide and well maintained. Although it is a mixed use trail most people out the day we went were hiking, however there were a few bikers on the trail as well. In total the hike was 3.78 miles and took 1 hour 43 minutes at a leisurely pace. The weather was perfect and this is a hike I’ll definitely hit up again. If you’re in the area this is worth checking out or any of the several others at the mountain. If you’d rather take it a bit easier there is a swim beach at the park as well as several picnic areas with grills, boat rental and cabins. 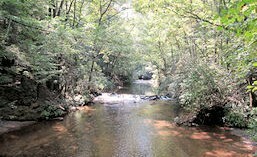 It’s an easy 30 minute ride from Atlanta and a great place to get away from the hustle and bustle. No GPX file for this one due to technical difficulties. It’s been a few weeks since I got a hike in and I was ready to go this weekend. Weather, work, holidays… ’tis the season, I guess. I made sure to get some time this weekend and was excited to check out a trail close to my house, even though it’s not in my 60 Hikes book, although I’m told that it will be in the next edition. This is the toughest hike I’ve personally done (remember, I’m a newb trying to lose weight) not counting Brasstown Bald. Although Brasstown Bald was a more strenuous climb it was only 1/2 mile each way and on a paved trail. 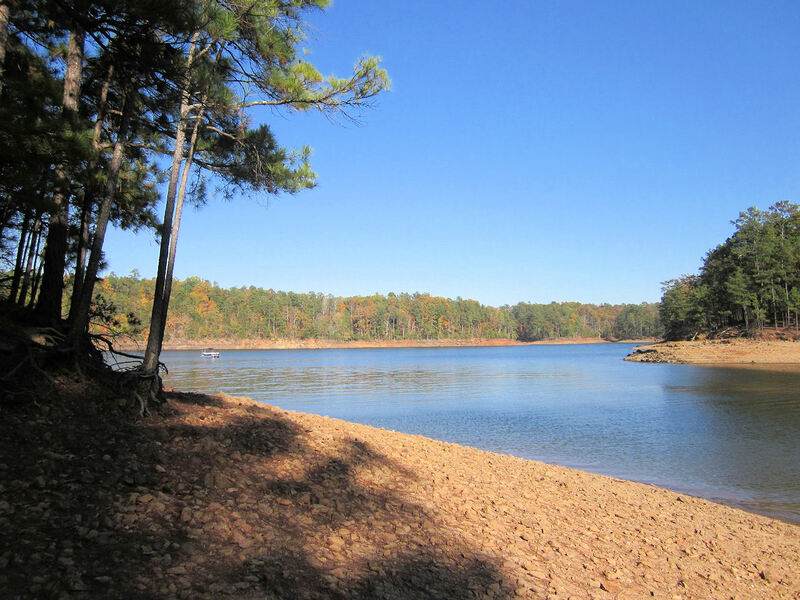 The Pine Mountain Recreation Area is situated on Lake Allatoona and not far from Red Top Mountain. It’s divided into a few trails as well as the summit overlook. I hiked the East Loop and Summit, the West Loop connects to the East Loop for those that would like a longer hike. For the East Loop and Summit my roundtrip was 3.04 miles, if you add in the West Loop the total hike is around 4.50 miles. There are several picnic areas and lake access close to the area, however for some reason most of them were closed this weekend. It’s important to note that a Georgia mountain is a bit less… mountainous than some of those beasts out West. The trail started at an elevation of just over 900 feet and at the summit it’s about 1,500. A good climb for me and the largest elevation gain of the trail I’ve hiked around here. It got my heart rate going pretty good and I burnt enough calories to have a few beers with friends after the hike and not even worry about it. The terrain also offers a bit of a challenge with rocks and roots along the winding trail. The view from the top was awesome and gave an almost 360 degree view of the area including Lake Allatoona and North Georgia. To make it even more picturesque there were a few hawks (I’m gonna call them hawks, could have been buzzards – I was pretty tired once I got up there) circling around over the lake. I’ll definitely hike this trail again, next time I’ll have to check out the West Loop as well. 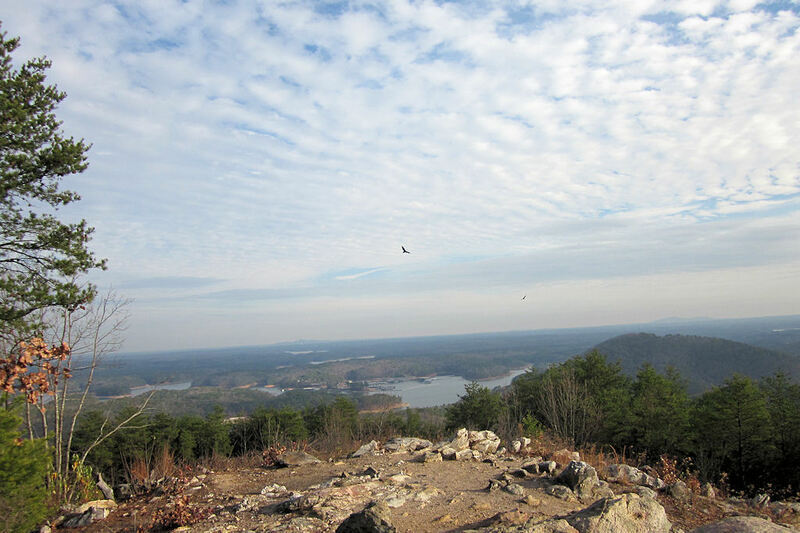 Pine Mountain Recreation Area is less well known than Kennesaw Mountain just a bit south, if you’re looking for a hike it’s a less crowded area and much more geared to the hiking than the history. 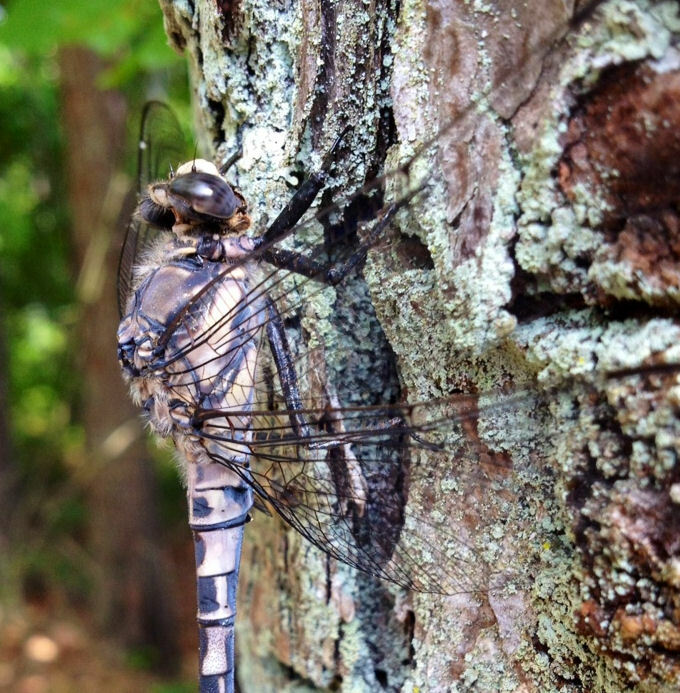 We had another gorgeous weekend here in Georgia and I definitely had to get a hike in. I caught up with my buddy and we headed up to Red Top Mountain State Park to hike the yellow blazed Homestead Trail, this is #18 in 60 Hikes Within 60 Miles of Atlanta. For a longer hike you can also add the Sweet Gum Trail as they share a leg, the book actually shows the Sweet Gum Trail as part of this hike but it is a separate trail. 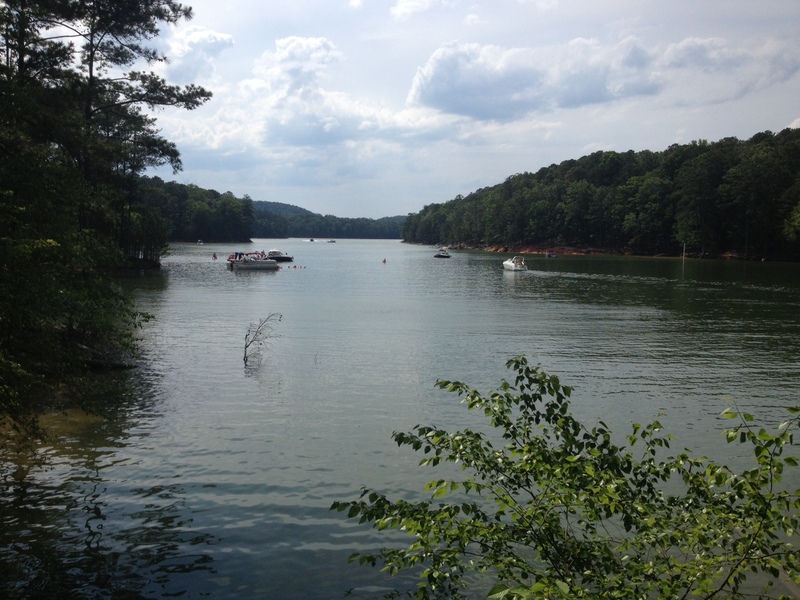 The park is on the banks of Lake Allatoona and it’s about 42 miles from the center of Atlanta (Junction of 75/85/20) via I-75. If you are looking for a weekend getaway there is a lodge, cottages, tennis courts, mini golf, camping, boating and more available at the park. After grabbing some BBQ for lunch we headed North and arrived at the trail around 2:30 PM. According to the book the trail is easy however both of us felt that “moderate” is probably more appropriate. Although the trail winds around the mountain it’s laid out so none of the uphill climbs are too aggressive but still offer a little boost to hear rate. Looking at the elevation chart in the book it’s hard to get a good idea of the actual slopes as the scale goes from 0 – 3600 but is rather small, even a rise of a couple hundred feet looks very small. I’ve attached my GPS map in the slideshow that will give a better idea of the elevation change. I really enjoyed this hike, seems like I say that every time I go out but I guess that’s a good thing as each trail has something to offer that I enjoy. As mentioned, the trail was not overly difficult but it did offer a bit of a workout. It’s a lollipop trail and the initial leg of the trail (the ‘stick’) is very easy terrain. After crossing over Lodge Road you hit the more challenging terrain and wind along the lake. There are some great views of the lake through the trees as well as a couple of areas where you can get along the banks. We found one spot where a couple had set up hammocks along the lake and were reading as their dog kept watch, nice way to relax. Although temps were fairly cool we did warm up a bit from earlier in the week and it made for perfect weather. The trees are at the point where they are very colorful but half the leaves are on the ground and give that awesome crunch as you hike through. My friend commented that some areas looked like shredded wrapping paper all over the floor on Christmas morning. The hike took us about 2 1/2 hours to complete and we hiked a total of 5.74 miles. We ended the day by heading back to my house for cigars and drinks. With a fire crackling in the fire pit we hung out on the patio until I got too dru…. I mean until we were all tired and needed to get some rest. All in all it was a great Saturday.